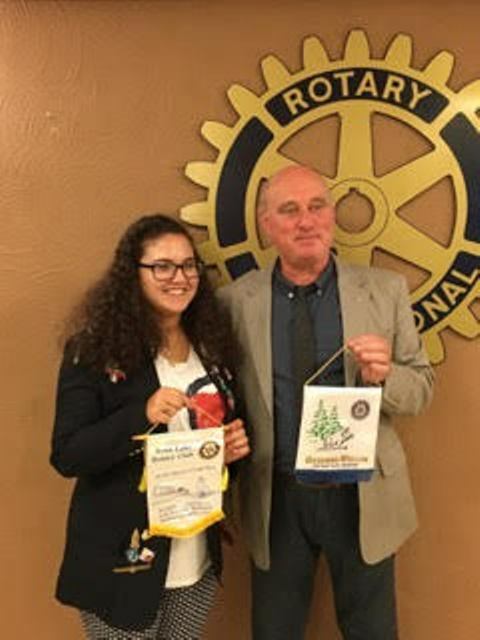 Inna Nikolova, a senior at Brookside High School, attended her first Rotary Club Meeting in Belgium her host country for this school year. (Its customary to exchange Club Flags.) When asked why she sought the exchange program, Inna said “The fact that I will come back completely fluent in another language is something that will benefit me in the future, especially in my career since I plan to major in International Relations.” Inna had the support of her family, fellow students at the North Coast Interact Club, and Brookside High School teachers and staff. To pay for her travel expenses, Inna worked at Wal-Mart in Avon, held fundraisers at Brookside and received contributions from North Coast Rotary Club and Interact Club and an anonymous donor. We are very excited for her. She promises to keep us updated as her adventure continues.